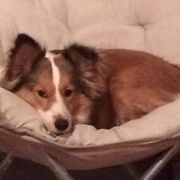 Kailey is the first sheltie that I could call my own. She was born on April 23, 2008, and is still here with us today. 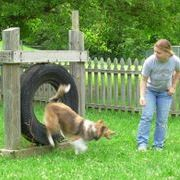 Kailey's skill-set involves tricks and agility. 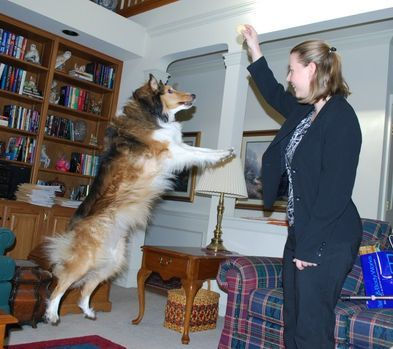 Due to her early onset of arthritis, she was never officially shown in agility. However, she loved completing the courses and would do so with ease. She still performs all of her tricks though! Kailey knows a ridiculous amount of tricks including roll over, paw / other paw, speak, back up, high five, high ten, pretty (a high jump in the air -- see picture), bow, up (stand up on her hind feet), jump, dance (puts her paws in your arms while you're standing up), spin / other way, play dead, head down (when laying down), and more! Of course, she also knows basic obedience as well, such as sit, down, come, wait, leave it, drop it, and stay. She even understands many things that we never taught her! She is just an awesome dog all around, and she will do anything for a "cookie." ...and there's probably some additional ones that I don't have either trophies, award baskets, winning dog tags, or other memorabilia from, so I just don't remember them. When I originally started entering her in these competitions, and she started winning them, I honestly wasn't really keeping track. 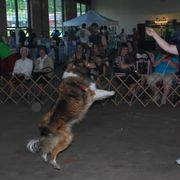 She was just enjoying competing, so we would enter her in any tricks competition we found. 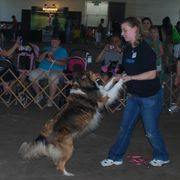 Photo above is of Kailey performing her "pretty" trick in 2012. 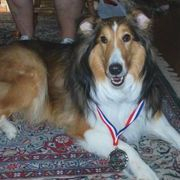 Photos below are from other trick competitions and her agility days when she was younger. 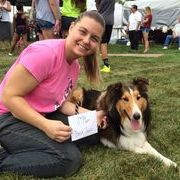 In addition, Kailey has trick dog titles! 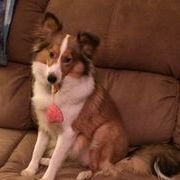 Unfortunately, despite her success as a performance / trick dog, Kailey was spayed at an early age, so she is unable to be bred. 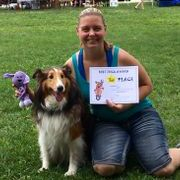 Kailey got 2nd Place in the Most Amazing Canine competition at Alsip in 2012! Waiting for results of Best Dressed... she won! Best Dressed Contest -- she won! 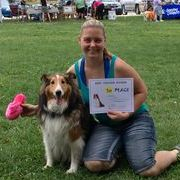 Best Trained Contest (obedience) -- she won! Best Trick Contest -- she won, yet again! Kailey being funny at Grammy and Grampy's house. Kailey always loved to play with other dogs, so the summer after she turned 6 years old, we decided to get another dog so she'd have a buddy to play with. We brought Taffy home in the summer of 2014. 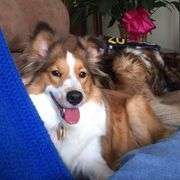 She was born March 25, 2014, and was purchased mainly as a companion for our other sheltie, Kailey. 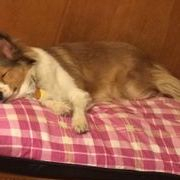 Taffy was an awesome dog and a great companion, and we constantly had people tell us that she was such a happy dog. She was always so happy to be around her people and she lived for belly rubs. You would go to pet her, and she would drop down to the ground and get on her back, so you'd have immediate access to her belly! It was adorable. 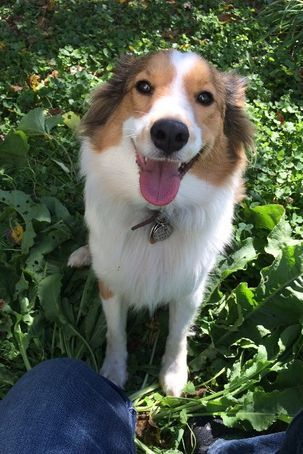 We always used to say that she was lucky she was cute, because she wasn't all that bright, but in reality, she was just always so happy to see her family, that her focus needed some work. She was a very sweet dog and we were all inspired by her love for life and she always made us laugh with her goofy expressions and her one ear that couldn't decide if it wanted to stay up or down. Unfortunately, Taffy passed in October 2015, when she was only 1.5 years old. Her memory lives on... we have a memory box for her, which says "Live Life in Full Bloom" -- as she did. And we try our best to do so, in her memory. Taffy relaxing on the couch at home. Taffy and me in our front yard. 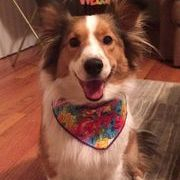 Taffy with her new bandana. 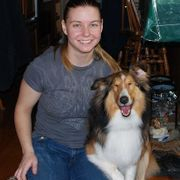 Taffy and me at Grammie & Grampie's house. Taffy relaxing on the oouch at home. Taffy on Grampie's lap getting pets. Taffy in a field at a friend's house. 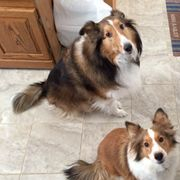 Taffy & Kailey sitting nicely for a treat. 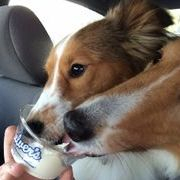 Taffy and Kailey enjoying some ice cream. 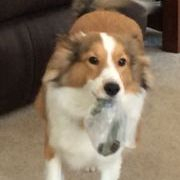 Taffy with "stolen goods" (something she shouldn't have). When Taffy passed away, Kailey became depressed and started exhibiting what we call "throw rug behavior." 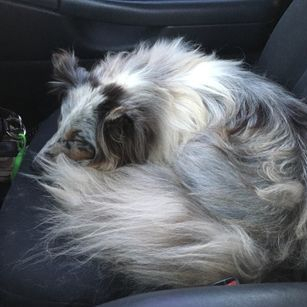 As Kailey has gotten older, she has become less active due to arthritis. However, having a companion keeps her running around, playing, and just all around being considerably more active. With Taffy gone, Kailey was companion-less, so, we had to find ourselves yet another dog. And so we found Misty. 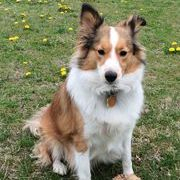 Misty came from a sheltie breeder in southwest Michigan. 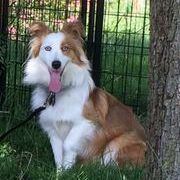 She was the pick of the litter, and was going to be kept and shown, but the breeder decided to retire from showing dogs, so Misty was looking for a home. She was born July 12, 2015. We made the drive and picked her up right at 12 weeks old. She was an absolute fluffball when we picked her up, and is now maturing into a smart and sassy young adult. While she's definitely a pretty girl, she has a goofy side to her that always makes us laugh. 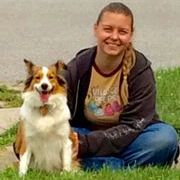 She is currently attending agility classes at Canine Connect Dog Sports in Valparaiso, IN. 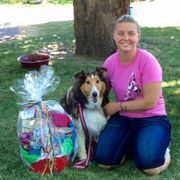 Her favorite piece of agility equipment is the A-frame, and she shows quite a bit of promise as an awesome agility dog! We can't wait to see how she turns out! 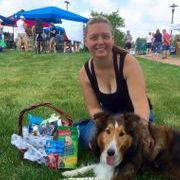 Misty now has several trick dog titles! So far, she also has one dog parkour title! 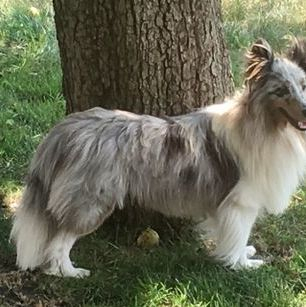 Sky came into our lives in late Summer 2017. 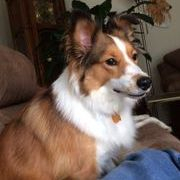 Sky was born February 7, 2014, so we got her at a little over 3 years old. She was the first dog we have owned that we haven't had since puppy-hood. She came to us, all the way from central Kentucky! 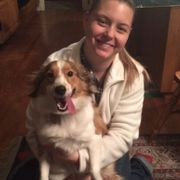 While getting a dog as an adult can pose some challenges, we are enjoying working with her and having Sky as a part of our family! 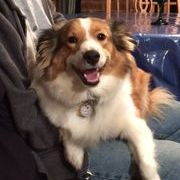 Sky is a spunky girl who loves to play! She gives Misty an outlet for some of her energy, when we're not training either of them. We can't wait to see how she turns out when we start her trick training and agility training in the future! 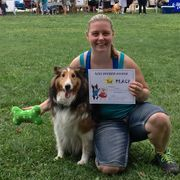 As of September 2017, Sky has now started performance classes at Canine Connect, and is working her way towards becoming a performance dog. So far so good!